The Arizona and California Railroad (reporting mark ARZC) is a short line railroad that was a subdivision of the Atchison, Topeka and Santa Fe Railway (ATSF). The ARZC began operations on May 9, 1991, when David Parkinson of the ParkSierra RailGroup purchased the line from the Santa Fe Railway. ParkSierra Railgroup was purchased in January 2002 by RailAmerica, the former owner of the ARZC. The Genesee & Wyoming railroad holding company purchased RailAmerica in December 2012. ARZC's main commodities are petroleum gas, steel and lumber; the railroad hauls around 12,000 carloads per year. At Cadiz, California, the railroad begins in the interchange with the BNSF Railway and continues southeast across the Mojave Desert to Rice, then east to cross the Colorado River Arizona/California state line at Parker, Arizona. The railroad continues southeast to Hope near Vicksburg then northeast to Matthie (near Wickenburg, Arizona). At Matthie, ARZC has trackage rights over the north-south BNSF line that connects Phoenix to BNSF's mainline at Williams. It also had a branch that runs from Rice south through Blythe, terminating at Ripley. 190 mile (306 km) mainline from Cadiz, CA (BNSF interchange) - Parker, AZ - Matthie, AZ (BNSF interchange). 57 miles (92 km) of trackage rights over the BNSF Railway from Matthie - Phoenix, AZ. 50 mile (80 km) former branch line from Rice - Blythe - Ripley, CA. Shortened as a spur for freight car storage. The mainline now used by ARZC was originally constructed between 1903 and 1910 by the Arizona and California Railway. 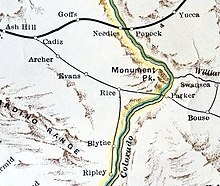 The line between A&C Junction, AZ, and Parker opened in June 1907. The Colorado River bridge near Parker was completed in June 1908 and by 1910 the line had reached Cadiz, California. In 1909, the Arizona and Swansea Railroad that connected Swansea from Bouse was completed. On November 22, 1921, a rail motor car carrying Santa Fe officials derailed north of Wickenburg, with five killed and four injured. A&C Junction was renamed Matthie in honor of the Albuquerque Division superintendent William Matthie. As late as 1937, there were several daily passenger trains on the line: #170-117 and #118-181 operated daily between Phoenix Union Station and Cadiz, with connections to Los Angeles and San Francisco; mixed trains #210-233 and #234-209 operated daily between Phoenix's Mobest Yard and Parker; and mixed trains #25 and #26 operated daily except on Sunday or Monday connecting at Rice for Blythe. Trains #170-117 and #118-181 as of June 1954 were hauled by Santa Fe's only ALCO RS-2, and shortly after were supplanted by a motor car; the trains were discontinued effective October 1, 1955. The Arizona and California Railroad Bridge a.k.a. "The Colorado River Bridge" was built in 1908. The Arizona and California Railroad Station in Parker, Az. In 1914, the California Southern Railroad (not to be confused with the earlier railroad linking Barstow and San Diego) was incorporated to build 42.2 mi (67.9 km) from a town then known as Blythe Junction (now Rice, California) to Blythe. The first spike was pounded on August 23, 1915 by Floyd Brown. The Interstate Commerce Commission reported the line as the longest built in the country in 1915. The first train arrived to Blythe in August 8, 1916 and the branch was extended to Ripley in 1920. Santa Fe leased the line on November 1921 and completed its acquisition on 1942. Blythe passenger service ended shortly after World War II, according to Santa Fe agent Ruben Gonzales. In March 12, 2009, citing declining revenues and worn out track structure, the ARZC petitioned the Surface Transportation Board to abandon all but the first four miles of the Ripley branch line. No trains have run over this line since late 2007 and the cost to repair the branch line would be significant. On June 30, 2009, the Surface Transportation Board granted the ARZC petition. A Blythe area committee formed to oppose the petition had found a customer willing to purchase the line, namely the owner of the BG&CM Railroad of Idaho. By January 14, 2010, the Surface Transportation Board terminated the offer of financial assistance for the railroad. The rail line was scrapped in 2011 beyond the first four miles from Rice. The diesel roster for ARZC's early years included five EMD GP20s, one GP38AC, three GP38Ms (former GP40s), three GP35s, and two MP15DCs. In 1996 five GP30s arrived to replace the GP20s. In May 2001, the railroad received four SD45Ms (two rebuilt SD45s and two rebuilt SD45-2s with SD40-2 specifications and bigger cooling systems) from VMV Paducahbilt. The railroad also owned or leased freight cars including twenty five Gunderson double stack cars, and possesses a former Santa Fe crane. The railroad also owned the former Great Northern Apekunny Mountain observation car, followed by former Santa Fe official car No. 58 which is now on display in the Western America Railroad Museum in Barstow, California. ^ a b c d e f David F. Myrick (2001). Santa Fe to Phoenix: Railroads of Arizona. Signature Press. ISBN 978-1-930013-05-6. ^ John F. Kirkland (1989). American Locomotive Company and Montreal Locomotive Works. Interurban Press. p. 143. ISBN 978-0-916374-81-5. ^ Kauke, P. C. (1955). "SANTA FE ENDS CALIFORNIA-ARIZONA MOTOR RUN". The Western Railroader, for the Western Railfan. F.A. Guido. ^ a b Lundin, Diana (1983-09-28). "Riding the rails: New world opened in Blythe when first train arrived in 1916". Palo Verde Valley Times. ^ Donald B. Robertson (1986). Encyclopedia of Western Railroad History: California. Caxton Press. p. 95. ISBN 978-0-87004-385-7. ^ "Fee Received". Retrieved July 21, 2013. ^ "Offer of Financial Assistance". Retrieved October 26, 2011. ^ "Arizona and California Railroad Photographic Roster". RR Picture Archives. Retrieved 2017-05-31. ^ Edward A. Lewis (1996). American Shortline Railway Guide. Kalmbach Publishing, Co. p. 27. ISBN 978-0-89024-290-2. ^ Railfan & Railroad. Carstens Publications. 2002. pp. 7–11. ^ "ARZC orders double-stacks. (Arizona & California orders rail cars from Gunderson Inc)". Railway Age. HighBeam Research. 1993-06-01. Archived from the original on 2018-11-19. Retrieved 2017-05-31. (Subscription required (help)). This page was last edited on 16 February 2019, at 18:33 (UTC).